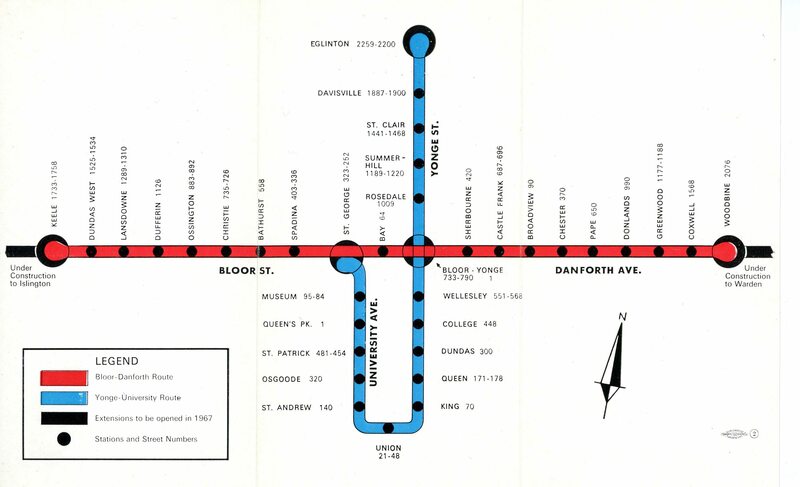 Joshua: I still think that an LRT would have been better for the Bloor-Danforth. 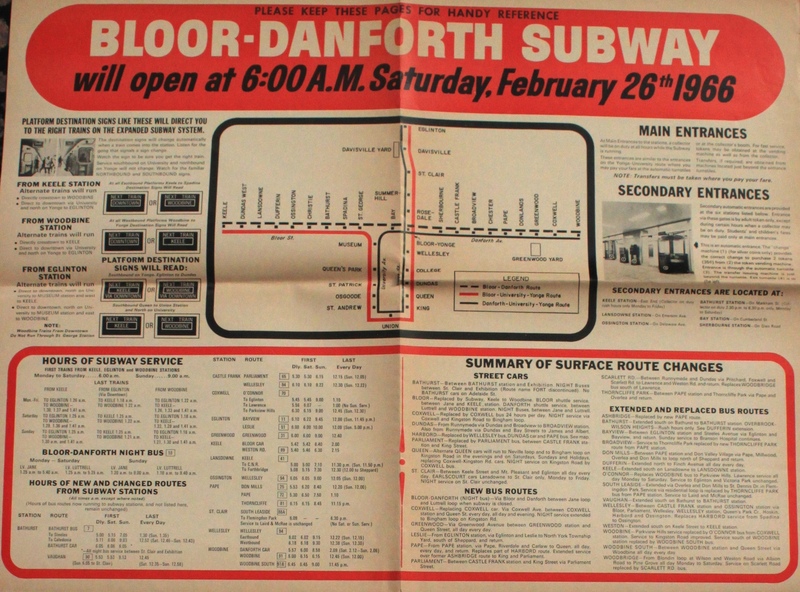 But the demand for subway extension to Scarborough today is many times higher than the demand for the Bloor-Danforth when construction began for it about 60 or so years ago; so why did you, Steve, not scream out then against the Bloor-Danforth subway as you scream out against the Scarborough subway today? Steve: It’s time you learned a bit of history. 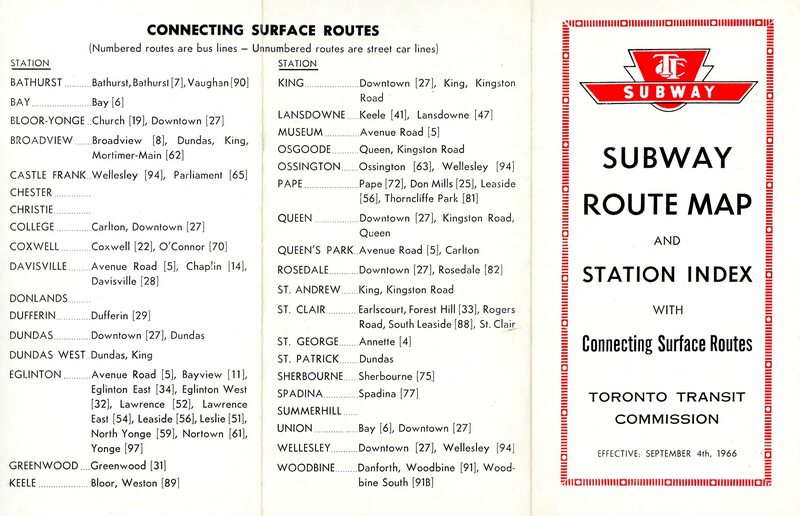 The Bloor Streetcar, in the latter days of its operation, was carrying about 8,000 passengers per hour when it ran only from Jane to Luttrell (the city boundary east of Main), and the suburbs had barely started to develop. There were parallel services taking people into downtown by various routes that, looking at a future subway corridor, were part of the same demand pattern. At that point, much of Scarborough was farmland. The future demand on a BD line was self-evident, and the limits on the streetcar network had been reached. By the way, when the BD subway was proposed, I was not yet 10 years old, and my screaming-out had nothing to do with bad transit plans. Also I notice that Steve always supports TTC fare increases but complaints about a much more modest Scarborough subway tax; the TTC fare increases are by far a much higher cash grab given that an average person takes the TTC more than a 1000 times every year. Steve: First off, I support fare increases because without the, the system will be strangled for service. It is ironic that Council has no problem imposing a tax whose cumulative value is 1.6%, or roughly $45 million per year, when it refuses to fund much more modest spending to improve service by the TTC. My complaint about the SSE tax is that it is inconsistent with claims that the city cannot afford to fund more transit, not that there is a tax. There should be more if Toronto is going to fund its share of many rapid transit projects. At least the Scarborough subway tax will bring us something in return (some very useful infrastructure plus jobs) whereas most of the TTC fare increases bring us nothing bus increased TTC salaries, increased TTC pensions, and increased TTC employee benefits. Steve: You left out the part about better service, but as you obviously have a hate on for the TTC as an organization, I don’t expect you to count that. Also, of course, much of the $50 million in “new service” the Mayor loves to crow about regularly has been funded not with higher subsidies, but with the fare increase and cuts elsewhere in the TTC budget. By all means, I do support good wages and compensation for our TTC employees but I just don’t think that fare increases are the best way to support that (higher income taxes, higher property taxes, and higher wealth taxes are the way to go since those don’t unfairly burden the poorest in society unlike TTC fare increases which punish the poorest who are forced to take the TTC unlike the rich who ride in Mercedes and BMW and Porsche and what not and NEVER take the TTC). Steve: I hate to break it to you, but a lot of people who are not poor take the TTC. I agree that there should be a way to make transit cheaper for the less well-off, but that is a completely separate issue. As long as Toronto Council and Queen’s Park don’t recognize the need to fund cheaper fares for poorer riders, the fares will be the same for everyone. However, the City is now studying what would be involved in providing lower fares as part of their “transit equity” study. Consider yourself lucky that I didn’t just purge this comment. Now piss off. 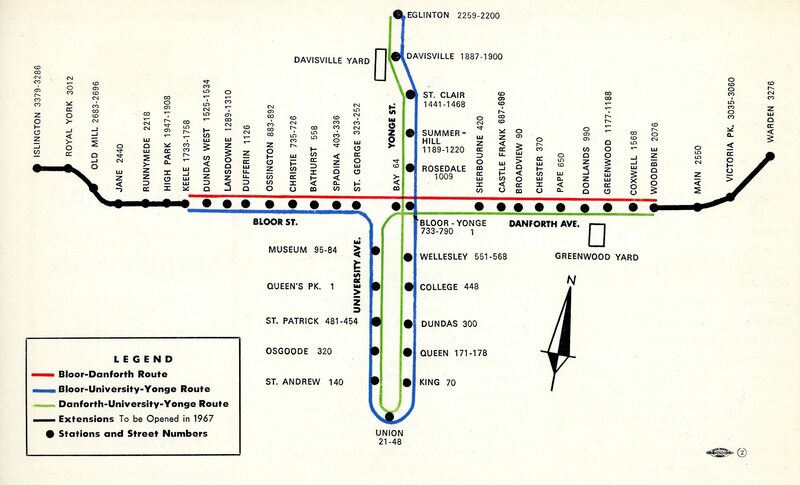 Instead of going with a Queen light rail (streetcars at the time) subway, they went further north with a heavy rail subway. The error was that it was further north. 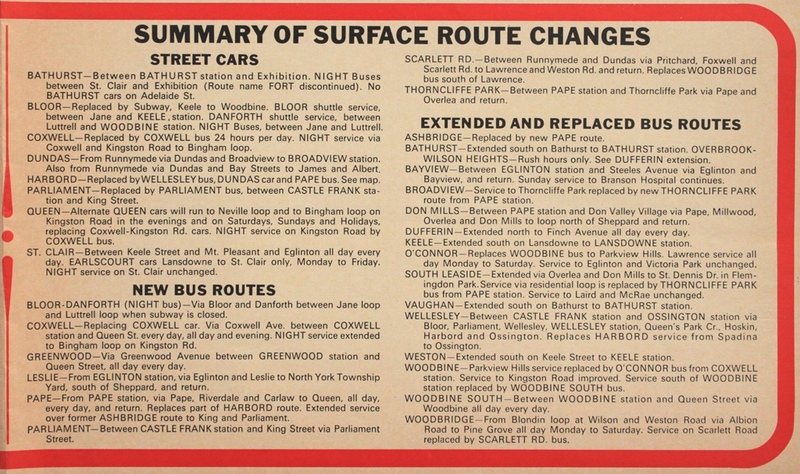 Passengers still needed to transfer to get to their downtown destinations, which added to the congestion on both Yonge and University (more so on Yonge). 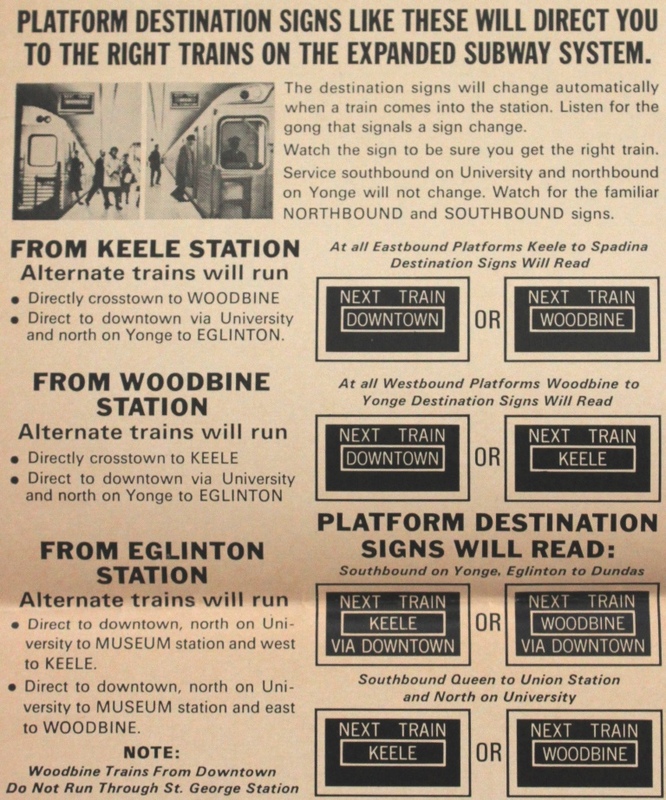 They only postponed a Queen (now to be called a “Downtown Relief Line” or a “Yonge Relief Line”) rapid transit line, decades later. Thereby voting non-confidence in the schedule. Otherwise, it would make more sense to have the signs change when a train leaves, so everyone could see the destination of the next train. Steve: Actually the signs changed before the next train arrived. The detector which triggered this was located in advance of the station, and it interacted with a transponder on the trains. Thanks for the post! I have always wondered about those destination signs as they seemed to be stating the obvious. 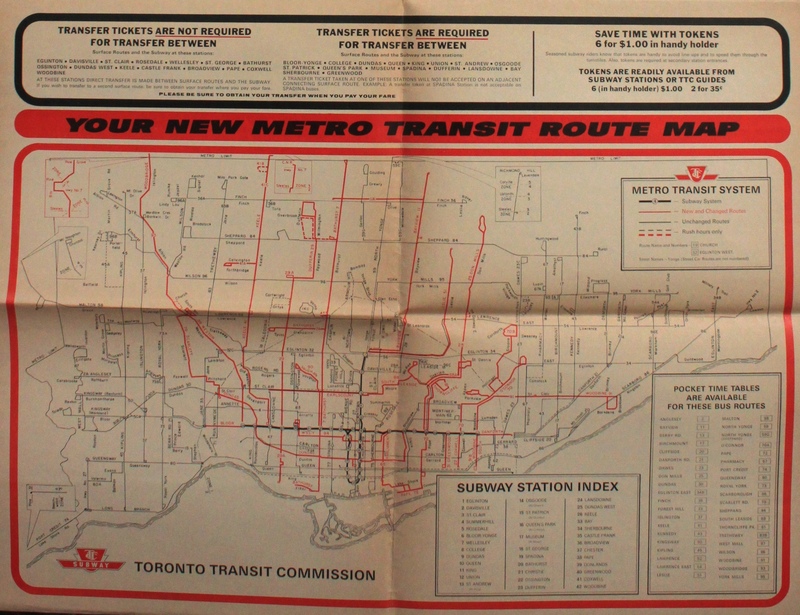 Probably not supposed to admit it, as I guy who writes elsewhere about transit in Toronto… but I didn’t grow up here. 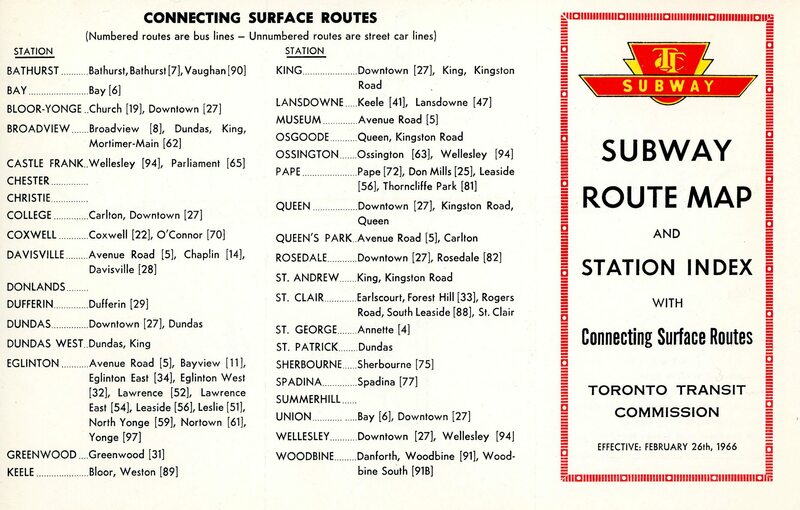 But my mother did, and one of the earliest signs of my impending transit nerdiness, was my excitement of discovering that series of colour ads in the Toronto Star announcing the subway and its various routing changes in my grandmother’s house in New Toronto. Thanks for posting the ads!